Even with the distinct style, the Funko Mad Max Fury Road Mystery Minis set manages to give the fierce characters much less of an intense appearance when compared to the gritty film. Considering the movie, this is not necessarily a bad thing. Although Furiosa and Max largely stick with their Pop! Mad Max looks, most of the other choices have a slightly different appearance and pose. This includes Capable, who stands with a scarf covering most of her body and her hair braided to one side. On the other hand, the Valkyrie looks even more threatening as the gun she wields is wider than her body. Also differing a bit from his larger self is Nux, whose two versions both offer a smirk. 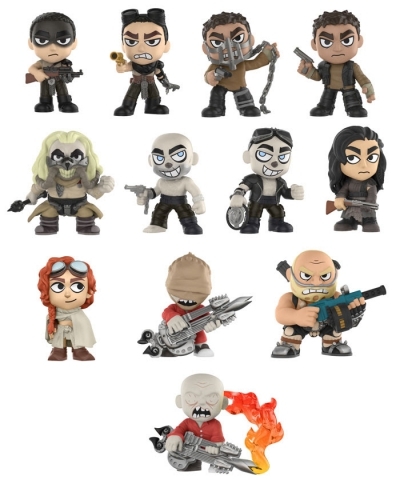 Additionally, the Funko Mad Max Fury Road Mystery Minis release contains Immortan Joe (masked, thankfully), Coma Doof blind, and Coma Doof with a flaming guitar. Lastly, Rictus Erectus, Immortan Joe's son, holds a rather large machine gun. 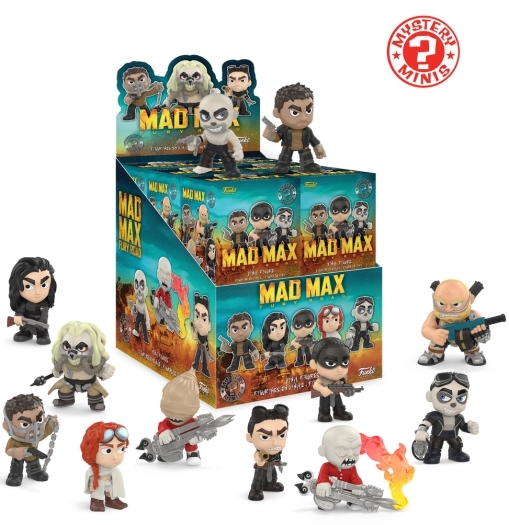 Issued in a blind-box format, there are at least 12 Funko Mad Max Fury Road Mystery Minis figures to locate. Of course, the hope is that with every box packaged alike, figures will remain a true surprise until unwrapped. Given that each case holds a dozen boxes, and barring any exclusives, collectors may only need one case to complete the set. However, it is possible that more than one case is necessary if some figures have increased rarity. Be sure to check back as we will update with the individual odds for Funko Mad Max Fury Road Mystery Minis once they are announced. Order Mad Max Fury Road Mystery Minis on Entertainment Earth. View other Funko Mad Max Fury Road options with our related guides.